The U.S. blackmailed the Philippines by leveraging the payment for war reparations (promised to Filipinos while fighting for America during WW2) dependent on Filipinos' acceptance of the Bell Trade Act-1946 (Parity Rights), which required a constitutional amendment by the Philippine Congress. That the amendment will get approval was ensured by then Senate President Manuel A. Roxas. Although now dated, the below essay by then Senator Ramon Diokno takes us to revisit our past so we can understand how present-day problems had their origins. Ramon Diokno was a former Associate Justice of the Supreme Court (February 10, 1954 - April 21, 1954) and former Senator of the Philippines (1946-1949). 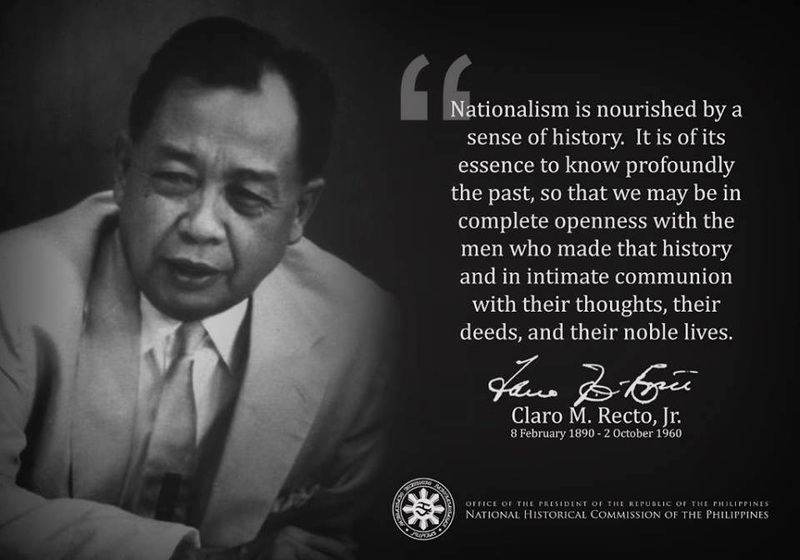 Note how Manuel Acuna Roxas, then Senate President (later first President after "granting of independence" on July 4, 1946) and other supposed native Filipino leaders used nationalist rhetoric in public but deep in their hearts and minds have only themselves and their class-interests. To put it mildly, they exemplify the boot-lickers' disgusting hypocrisy and mendicancy. With them as poster boys of traitorous and corrupt rulers, our generations of subsequent rulers got their "role models" to follow and lead us native Filipinos majority on the road to our national perdition. The deceptions demonstrated then by our ruling elite: many members primarily from the middle and the landed/aristocratic classes --in cahoots with and/or subservience to foreign masters/partners--- live on today; a continuing past for our next generations: our children, grandchildren and posterity. We native Filipinos only deserve the misery of our national predicament that crept and continually creep on us. Especially the rest of us who consider ourselves as the so-called educated who go on our merry ways while casting blame on the dirty, children-littered, illiterate and hungry native masses (better if we could sterilize them, right?!). Thanks in no small way to our apathy (since we are not directly or adversely affected) and our disinterest/ignorance as we are class-conscious citizens in endless pursuit of the classy/uppity/aristocratic station in life.... Oh, and thank God for the "blessings." Editors' Introduction: U.S. officials has promised Filipinos during the war (WW2) that their continued loyalty to the United States would be rewarded by rehabilitation funds at the war's end. Legislation passed by the U.S. Congress, however, tied full rehabilitation aid to the Philippine acceptance of the "parity" provision of the Bell Trade Act-1946 (Parity Rights). Even with this pressure, Philippine Acceptance of the Trade Act and "parity" was accomplished only by the highly questionable ejection of some opposition senators and representatives from the Philippine congress. One of the ousted senators here describes what occurred. On June 29, 1944, the United States Congress adopted a joint resolution, signed by the president, which stated: "That the United States shall restore as quickly as possible the orderly and free democratic processes of government to the Filipino people, and thereupon establish the complete independence of the Philippine islands as a separate and self-governing nation." Many Americans may believe that this goal was achieved on July 4, 1946. yet what is the real situation in the Philippines today, five months after the granting of independence? Orderly and free demcratic processes of government do not exist. The Philippine Constitution (1935) is being deliberately violated for the material benefit of a handful of business interests. many of the men responsible for these violations are Filipinos that fall within the scope of president Roosevelt's directive ordering that all those that collaborated in any way with the Japanese should be removed from office. Finally, the Philippines is not a genuinely independent country, but only a "banana republic" comlete with American military bases. These facts seem to me a cause for justified concern on the part of all Americans. To begin with, it will be recalled that after the liberation of the Philippines, the Philippine Congress held a special session. One of its first actions was to pass a law appropriating some ten million pesos for the payment of the entire back pay of congress members and their secretaries, that is, for the payment of their salaries during the three years of japanese occupation. This measure was enacted in total disregard of the fact that during this period they did not fulfill their duties and that a majority of them collaborated with the Japanese. The completely selfish character of this action was emphasized by the fact that no similar provision was made for other officers and employees of the Philippine Government. At the same session, the Philippine Senate was faced with the constitutional mandate that the senators shall be divided equally into three groups; "the senators of the first group to serve for a term of six years; those of the second group for four years; and those of the third group for two years." The term of the senators in the third group had already expired as of December 30,1943. Now it is well-established rule that Congress has no authority to extend the term of office prescribed by the Constitution. The Senate, however, decided to make the division by lot, subject to the following conditions: first, that two senators who had died during the Japanese occupation be regarded as belonging to the third group, thus reducing the number of senators that would have to fall into this category; and, second, that senators in the second and third groups continue in office until the election of their successors, receiving all salaries and emoluments in the meantime. The president of the Senate under whose direction these decisions were made was Manuel Acuna Roxas, now President of the Philippines. On April 23, 1946, a general election was held to choose a president, Vice-President, sixteen senators (out of a total of 24), and the full quota of ninety-eight representatives. In the Philippines, senators are chosen at-large, while representatives are chosen by districts. The law provides that those elected and certified by the Electoral Commission shall assume office on the date fixed by law and that anyone obstructing the operation of this law shall be punished. There is also a special amendment to the Philippine Constitution pertaining to the seating of elected members of Congress. In the United States, the Constitution provides that each legislative house shall be the sole judge of that elections and qualifications of their respective members, and that both the Senate and the House of representatives shall have the power to suspend temporarily any representative or senator when they believe that there is a case of evident falsity of returns, or fraud in the elections, or lack of qualifications. A similar provision was embodied in the Philippine constitution until 1935. But experience proved that decisions such cases were based on political rather than judicial grounds. Therefore, a Constitutional amendment was adopted by which the authority of the legislature in this matter was transferred in toto to a constitutional body named the Electoral Tribunal. It is against this constitutional background that the events following the elections of April 1946 must be judged. The elections were won by the so-called "Liberal Party" headed by Manuel Roxas, but a considerable number of opposition senators and reresentatives were elected. For the Senate, the opposition group won seven seats, which gave them a total of eleven senators out of the twenty-four, and in the House of Representatives, they hold thrity-eight of the ninety-eight seats. Though the Roxas Party won a majority of the Senate with thirteen seats, two of their senators were sick, two others had been indicted by the People's Court, and three more (one of whom had been indicted as a traitor) had forfeited their seats by acceptiong judicial positions. To deal with this situation, the Roxas majority adopted the following procedure: they allowed the indicted traitors to take their seats. They refused to take action against the three senators that had forfeited their seats. And they suspended indefinitely three minority senators because of alleged irregularities in their election. Namely, Justice Vera, President of the Nacionalista Party; Romero, keynoter in the Nacionalista Party Convention; and the author. The resolution for suspension of these three men was adopted by the Senate in the absence of the opposition senators, without a quorum, and in violation of the Constitution of the Philippines. In the House of Representatives, a resolution for the suspension of seven representatives of the opposition was filed simultaneously. Though this resolution was not adopted immediately, the Speaker made it effective at once by ruling that while the resolution was pending, the representatives affected could neither take their seats nor speak on the floor of the house. The resolution was then referred to a committee, where it still rests. All these took place despite the fact that the election of the senators and representatives concerned had been certified by a majority of the Electoral Commission. Subsequently,, the opposition parties filed a protest with the Philippine Supreme court but the latter, after being "reorganized" at the instigation of president Roxas, washed its hands of the whole matter. The aims that President Roxas was seeking to accomplish by these unconstitutional tactics, and the policies that his regime intended to pursue, was first demonstrated when the Philippine trade Act came up for consideration by the Philippine congress. The terms of this Act, as drafted by the United States Congress.required that the Philippine Constitution be amended in order to provide American capital with the same rights as Filipino capital in the Philippines. According to the Philippine Constitution, an amendment requires a three-fourths vote of all members of both Houses --not merely three-fourths of those present and voting. In other words, an amendment requires the affirmative vote of 18 senators and 73 representatives. The Roxas majority party, however, ruled that in deciding upon this amendment, the votes of those members of Congress that had been temporarily suspended would not be counted, notwithstanding the fact that the senators ans representatives concerned were (and still are) receiving their salaries, and that only the Electoral Tribunal can legally deprive them of their votes. Under this arbitrary system of computation, the votes of only 16 senators and 68 representatives were needed to pass the required amendment, and thanks to the accurate planning of the Roxas majority, this was the exact number of votes cast in its favor. To understand the significance of this maneuver, it is necessary to bear in mind the terms of the Bell Trade Act (Philippine Trade Act),1946. This Act establishes a monopoly of the principal Philippine products that favor American business interests established before the war, and thus obstructs the development of new Filipino enterprise. Under the terms of the Act, American businessmen can import products into the Philippines free of duty, quotas, and price ceilings, whereas Philippine exports to the United States are subject to quota restrictions. Furthermore, Americans are given the same privileges in the Philippines with regard to property, business and industry as those enjoyed by Filipinos, whereas similar privileges are denied to Filipinos in the United States. Even worse from the standpoint of Philippine business is the fact that, by Executive Order of President Roxas, Filipino businessmen are forbidden to export their major products such as copra, lumber, etc. to countries other than the United States, even though these countries may offer higher prices. The Trade Act was sponsored by Mr. Paul McNutt, former High commissioner and now American Ambassador to the Philippines, who is an intimate friend of President Roxas. Senator Milland Tydings, one of the authors of the Philippine Independence Act of 1934 regarding the Philippine Trade Act, stated that: "Fundamentally, he (McNutt) is opposed to Philippine Independence, and if you ask him he would tell you so. The truth of the matter is that most of the people, outside the Filipinos, who favor this bill are fundamentally opposed to Philippine independence. Many of them told me so. Their whole philosophy is to keep the Philippines economically even though we lose them politically." The text of the Trade Act, as finally enacted by the United States Congress, entirely confirms this view. So does the clause in the Philippine Rehabilitation Act, providing that no rehabilitation funds in excess of $500 shall be granted to the Philippines unless the Trade Act is accepted. The terms of the Trade and Rehabilitation Acts indicate that the official United States representative in the Philippines will have, for sometime at least, a preponderant control over both the Philippine government and the Philippine economy. The continuance of American control, however, could not have been achieved without the solicitous assistance of the Filipinos that now rule our country. The Roxas government, which is headed by collaborators, obviously felt that it could nopt survive unless it accepted the Trade Act in order to open the way for American financial and military aid. It needed money not only for material rehabilitation, but for maintenance of an expensive governmental system. It needed military support because large number of Filipinos were retaining the arms that they had used so effectively against the Japanese. lacking faith in their government, they were convinced that to surrender these arms would be tantamount to surrendering their hard-won freedom. Confronted with this formidable opposition, the Roxas Government chose to sacrifice Philippine independence for the sake of advantages to be gained from American political and military support. This decision was not surprising, inasmuch as these were the same Filipinos that had worked readily with the Japanese, and that would have been removed from political and economic influence if president Roosevelt's directive regarding collaborators had been carried out. I must leave it to the American people to decide whether the 1944 resolution adopted by the United States Congress has been fulfilled; whether the American Government has given my country a square deal; and whether the kind of government that now exists in the Philippines deserves the financial and military support of the United States. "Roxas Violates the Constitution," Ramon Diokno, Amerasia, Vol. 10, No. 6, December 1946, pages 75-78. For further details, see: "Philippine Acceptance of the Bell Trade Act of 1946: A Study of Manipulatory Democracy," Stephen R. Shalom, Pacific Historical review, Vol.49, No.3 August 1980, pp. 499-517. Hi Mr Bert, although that is known of Roxas about the Parity Rights, it is fallacious to say that Roxas railroaded the parity rights... Because as far as I know post WwII, the Phil had in dire need of money needed for reconstruction as the damage in Manila and other parts of the Philippines was so heavy.. As I could remember, P.Roxas had promoted the Filipino First policy just like how Trump is tweeting about it now in the midst of Chinese want to export their products to US. At the time of P. Roxas, the sugar industry was the only fully-developed indigenous industry... Although his region benefited from the sugar trade, I think it is unjust to blame on P. Roxas the railroading of parity ordinance ehen deep in his heart he was promoting our own sugar. Fastfwd to now, how is our sugar industry!? It is being dominated by sugar from other countries... What is the Phils' well developed industry at the moment after less than hundred years of independence from the US? Do we have one? Remember too Sir that post world war second, the government bureaucracy was composed of elite and educated bureaucrats. There were accounts of highly competitive workforce.. Maybe those things I read in encyclopedias that the got of P. Roxas was mired in corruption is not true at all.. Moreover for how many years was P. Roxas a President? Is it not 2 years or less?